The February 2019 WASDE report came out today and all the estimates came out as expected. I can not remember a more uneventful report with so much data being released. It is clear that the market is waiting on a US/China trade deal resolution. Going forward we see the markets are range bound and we will trade them accordingly starting Monday. Make sure you take a listen to Turner’s Take Podcast for a deeper dive into the report! Below in yellow are the results of this January/February WASDE report. Corn yield was lower but so was ethanol demand and feed usage. 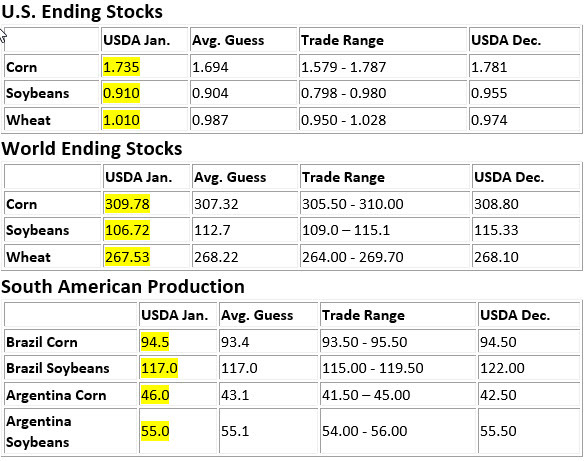 The result was lower corn ending stocks but not as much as we were hoping for. Soybean yields were lower too but so were exports. It looks like the USDA has not fully caught up with the new China export sales. Wheat acres came in as expected as did South American production. 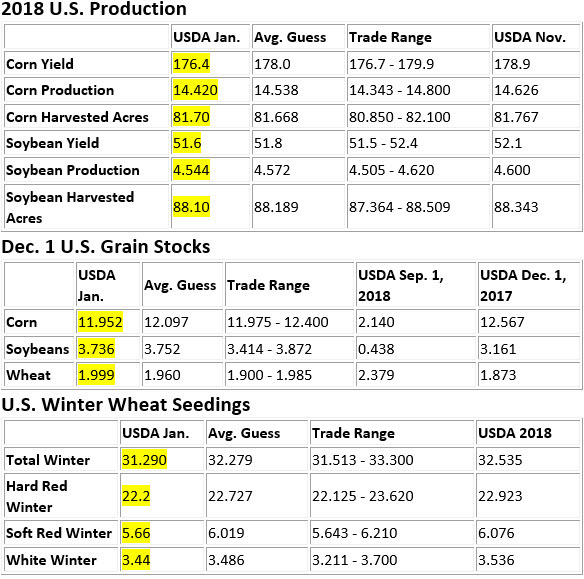 Going forward we are going back to our short old crop corn straddles. We see corn as range bound, but we are more bullish than bearish at current prices. We also like short straddles on new crop. Wheat is getting attention on the export market as Egypt bought US SRW wheat earlier today. South American production has stabilized as the weather is returning to normal. The next two big catalysts are 1) The Ag Forum and then 2) the US/China trade deal. We do not expect a deal to be complete until the deadline. These things always tend to go right up to the last minute.